Ladies and Gentleman, Deviyon aur Sajjano, it’s finally official! Sonam Kapoor and Anand Ahuja’s love story has been nothing less than a fairytale. And ever since the news of them getting hitched started doing rounds on the internet, our excitement levels have been soaring! After all the speculations and rumors, the cute duo is all set to tie the knot on May 8th this year. Both families released a joint statement announcing the wedding which is to take place in Mumbai. Known for their PDA on social media, the soon-to-be-married couple engaged in a cute conversation on Instagram after their official announcement. Anand posted a quote, “Those who don’t believe in Magic will never find it,” by Roald Dahl on his Instagram page, to which Sonam replied “#everydayphenomenal.” Those who don’t follow their social media pages regularly, #everydayphenomenal is their personal hashtag which they use whenever they post pictures of each other on their page. The wedding is expected to be a low-key affair, but the Sangeet ceremony will be grand and choreographed by Farah Khan. It is speculated that the one and only Karan Johar will be organizing and planning the Sangeet… Need we say anything more? We’re totally expecting a straight outta Bollywood movie, tbh. The rehearsals have already kicked off at Anil Kapoor’s Juhu residence, which is decked out with lights. I am sure dear Daddy will be performing a number at his daughters Sangeet. The Neerja queen and Delhi-based business man’s wedding will be held in three different locations personally picked by Sonam. 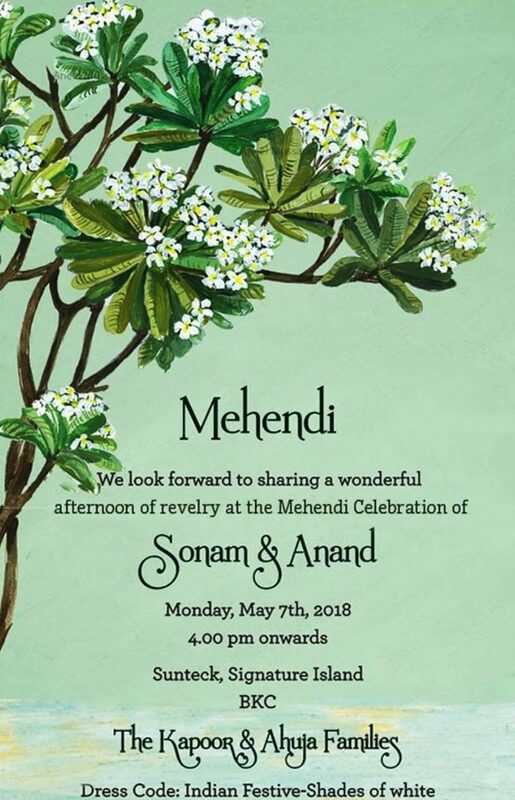 The Mehendi ceremony will be taking place at Sonam’s luxurious duplex apartment in Sunteck Signature Island building at Bandra Kurla Complex. It’s reported that the ceremony will be conducted in a ballroom-like banquet area of the building. Invites request guests to wear Indian festive shades of white for the function. 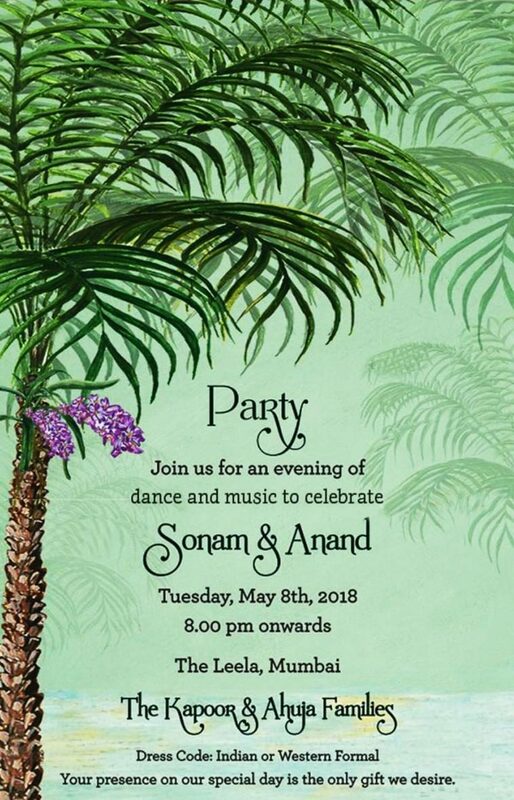 The traditional wedding ceremony will take place in the afternoon at Sonam’s aunt, Kavita Singh’s heritage mansion in Bandra- Rockdale. It is one of the most gorgeous properties in Mumbai with a spectacular view and stylish interiors. (That explains the choice of venue for the occasion). 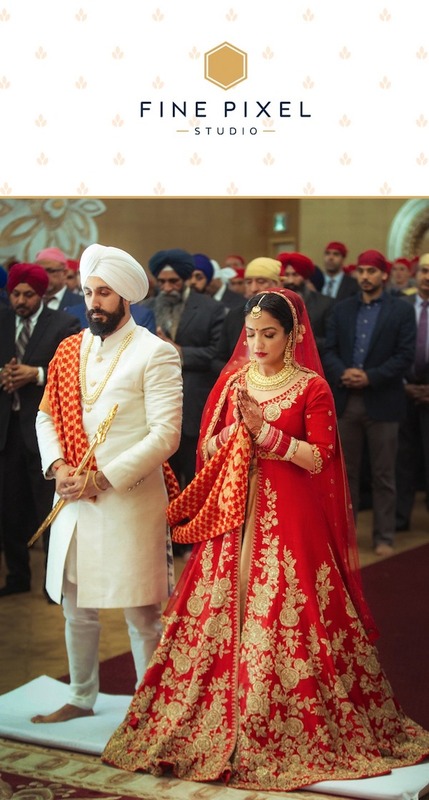 The ceremony will be held following Sikh religious traditions, otherwise known as the Anand Karaj. For this, the invitees have been asked to wear Indian traditional attire. The post-wedding reception will be held the same day’s eve at The Leela Mumbai, which belongs to her close friend Samyukta Nair’s family. We can only imagine all the celebrities who will grace the wedding to congratulate the newlyweds. 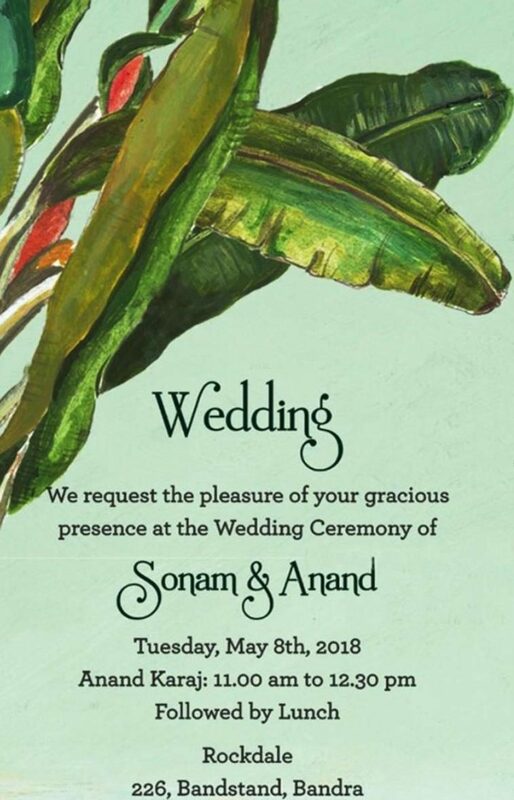 While all the other celebrities went for grand box type wedding invites, it’s amazing how Sonam stuck to simple e-invite style. Her floral and simple green shade invitation is winning hearts. The wedding invite of the duo is just as elegant as the couple. The theme of the card is nature and even the font used is extremely sophisticated. (Sonam, please stop melting our hearts- although we’re certain that you can’t help it). All of us are collectively waiting to know who Sonam will pick to design her wedding Lehenga! She is a fashion style icon, so it isn’t necessarily going to even be a Lehenga. Well, what we do know is that her favorite designers are Anamika Khanna and Abu Jani-Sandeep Khosla. Sonam has donned a number of knockout ensembles by Anamika from time to time and walked the ramp for many of Abu Jani-Sandeep Khosla’s fashion show. Unfortunately, we will only know the confirmed designer closer to the date….. But come-on, she is gonna look drop-dead gorgeous irrespective of who she wears. Sonam’s bride-tribe is going to be nothing less than cracking too- from Jacqueline Fernandes to Masaba Gupta, we’re excited to see all of Sonam’s besties play the most gorgeous bridesmaids ever! Here is what you need to know about him. Anand Ahuja is a Delhi-based businessman and the CEO and co-founder of Bhane, an apparel manufacturing company. After Sonam began dating Anand, the brand has been spotted on her several times (naturally, she’s supporting her beau!). He also owns Veg Non-veg, a multi-brand sneaker boutique in Delhi. He is crazy about sneakers and you can see that clearly on his Instagram page. Anand studied at American Embassy School and later completed his post-graduation from Wharton School at the University of Pennsylvania. He worked at Amazon.com in America before moving back home and joining his dad, Harish Ahuja, in his business ventures. Anand is rumored to have met Sonam in 2014 through fashion designer Prernia Qureshi, who is Sonam’s stylist. He often shares Sonam’s pictures and promotes her films and projects on Instagram (adorable, right!). Sonam and Anand are truly the cutest couples in Bollywood and it goes without saying that their wedding is going to be a big fat Indian wedding we all wish we could attend. We’re counting days to witness all the action and bet you are too! Don’t worry, we’ll keep you posted!